The Prince of Swords (Knight in the Rider-Waite tradition) represents the personality that forms from the airiest part of Air; the Air of Air. He is the most abstract and principled person once can imagine. His personality is the expression of ultimate Air and Swords; he is the pinnacle of Abstraction, Principles, and Thought. He is the Philosopher and the Intellectual. He is aloof and detached from society, but not because he chooses to; he works on another plane, thinking above most others, and his ideas are so abstract that they have no practical basis. He lives in a rational fantasy, and has no clear purpose save to think. He is full of ideas, but most of them are impractical. He is inaccessible and not understood; he is the genius who lives by himself. Often brilliant, he is unable to effectively communicate his thoughts, and his genius may then be lost to the world. 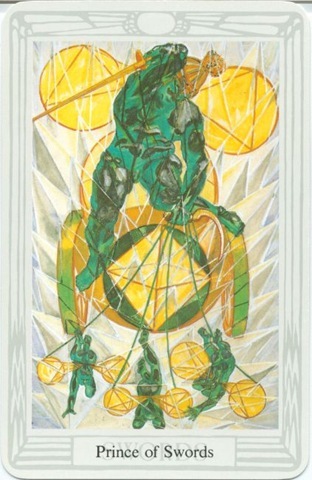 Einstein was in many ways a Prince of Swords; he thought in very abstract terms and was inaccessible to most, his mind functioning on a higher plane; the KANSAS song “Portrait (He Knew)” also reflects this card.